he Kingdom of Bahrain is a small island country situated near the western shores of the Persian Gulf. Located just off the eastern coastline of Saudi Arabia, Bahrain is a small archipelago of 33 islands, with the largest island being Bahrain Island. Modern causeways connect the four main islands, and all are connected to Saudi Arabia by the 16-mile-long King Fahd Causeway. The peninsula of Qatar is to the southeast across the Gulf of Bahrain. 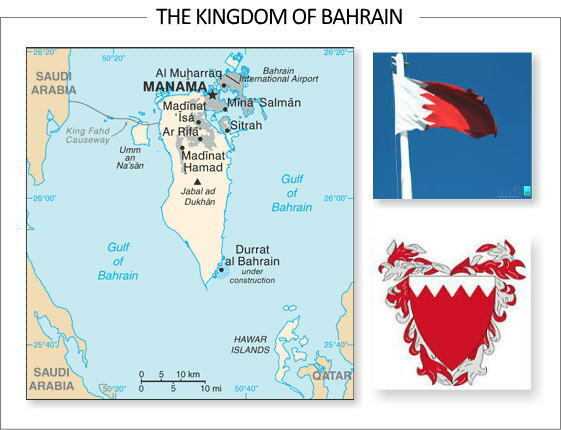 Since the end of the 18th century, Bahrain has been ruled by the Al Khalifa royal family. Bahrain was the seat of British power and control in the Gulf until it gained independence in 1971. Since 1999, the country has been headed by the King, Shaikh Hamad bin Isa Al Khalifa. Ninety-two percent of Bahrain (especially Bahrain Island) is primarily barren desert, with a limestone surface. Periodic droughts and dust storms are the main natural hazards for Bahrainis. Summers are very hot. The seas around Bahrain are very shallow, heating up quickly in the summer to produce high humidity, especially at night. Summer temperatures may reach up to 50 °C (122 °F). Rainfall in Bahrain is minimal and irregular and occurs mostly in winter. The kingdom combines modern Arab culture and the archaeological legacy of five thousand years of civilisation. Petroleum processing and refining, as well as international banking are the major industries. Oil was discovered in Bahrain in 1932, the first such find on the Arabian side of the Persian Gulf. It brought rapid change to the country. Bahrain has the first “post-oil” economy in the Persian Gulf because the Bahraini economy does not rely on oil. Since the late 20th century, Bahrain has heavily invested in the banking and tourism sectors. The country’s capital, Manama is home to many large financial structures. Most of the modern population is concentrated around Manama, the capital city, and much of that population (about 30%) are non-Bahraini immigrants. The state religion of Bahrain is Islam and most Bahraini citizens are Muslim. While Islam is the main religion, Bahrainis are known for their tolerance towards the practice of other faiths. 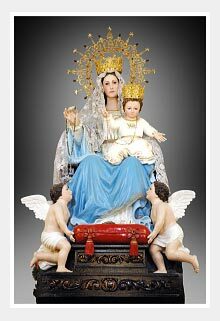 There is a native Christian community in Bahrain. Christian Bahraini citizens number 1,000 people. Bahrain also has a small native Jewish community. 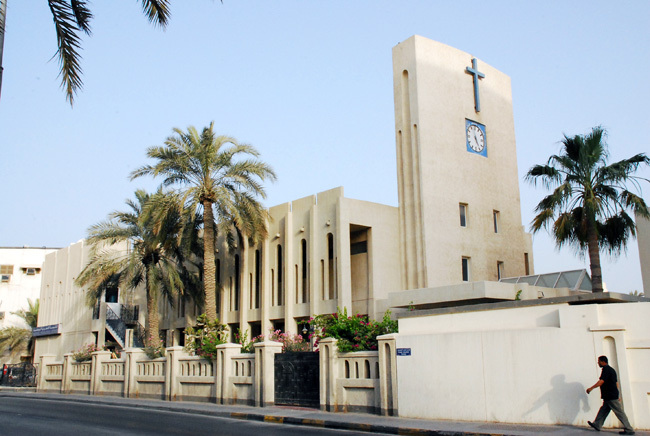 The Sacred Heart Catholic Church in Manama, Bahrain is the oldest in the Arab Gulf region.